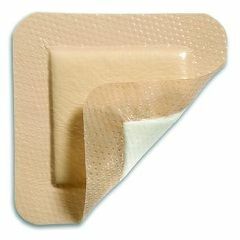 Allegro Medical offers a wide variety of medical foam dressings for sale at wholesale prices. Whether you are looking to treat bed sores, dermal ulcers, symptoms related diabetes, or other skin conditions you are sure to find the foam dressing products and supplies you are looking for from names you can trust. Browse our inventory of top wound dressing products from trusted brands such as Copa, Ferris, Mepilex, Restore, Smith & Nephew, and many more. AllegroMedical.com offers only the highest quality skin dressing products and accessories at the lowest prices guaranteed. See our Best Price Guarantee for more details. MEPILEX Border Lite Dressing - 4 x 4"
MEPILEX Border Lite Dressing - 3 x 3"
MEPILEX Lite Dressing - 4 x 4"
COPA Ultra-Soft Foam Dressing 4 x 4"
MEPILEX Border Lite Dressing - 1.6 x 2"
Optifoam Non Adhesive Dressing - 4" x 4"
Restore™ Foam Heel Dressing with Silicone - Non-Border 5" X 8"
MEPILEX Lite Dressing - 6 x 6"
PolyMem WIC Silver Rope Wound Filler - 0.4" x 14"
COPA Ultra-Soft Foam Dressing - 2" x 2"
Clearance - COPA Ultra-Soft Foam Dressing - 4" x 8"
MEPILEX Border Lite Dressing - 6 x 6"
Hydrofera Blue Foam Dressing - 6" x 6"
Mr. Hood, Thank you very much for your email. I was completely amazed that I received my order from you within less than 24 hours of placing the order! I realize that it's not that far from Grapevine/Dallas to Seabrook/Houston, but this is definitely the quickest order I have ever received. I was impressed with the "Get to know Allegro" information on your website, and that you provide that information on your order summary page. It has been a pleasure doing business with you.